Argentina celebrates it's second animation only festival this week end on October 22nd, 2016. It's a one day festival which celebrates with the likeminds of people who are interested in art. According to Bit Bang Fest, "Bit Bang Fest is the most important event of animation, video games and digital art made in the city of Buenos Aires.We disseminate, promote and reward innovative, innovative, experimental artistic proposals and authorial character through projections , exhibitions and competitions . We place special emphasis on training, so that during the festival will offer workshops , lectures , seminars and master classes with the most important references worldwide. In addition, there are debates, jams game shows indie games, facilities, salts escape, mapping, VJ and more!". Registration for Workshops will open during the festival, at 13 pm. at the gateway of Da Vinci School, Av. Corrientes 2037. You can save a seat for yourselves, by registering yourselves online: bitbangfest.com/. Admission is free. 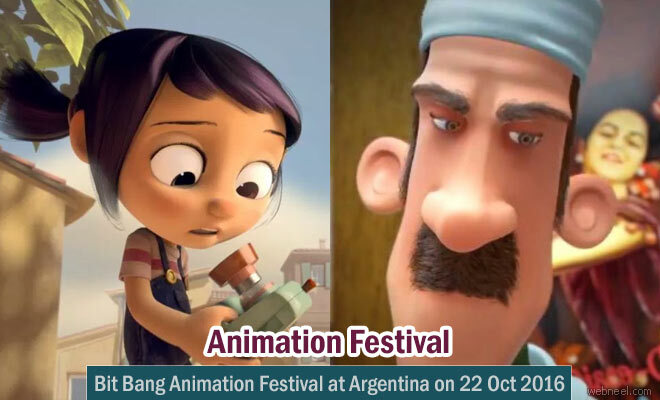 Bit Bang Animation Festival at Argentina Neel Argentina celebrates it's second animation only festival this week end on October 22nd, 2016. It's a one day festival which celebrates with the likeminds of people who are interested in art.